Fa-Nuit-Hen, or the Multiplier of Motions Known, is a demiprince known for his sword-teachings. He is said to haunt the warriors who fell and still wonder why. He is a scion of Boethiah and rules over the pocket realm of Maelstrom. In The Thirty-Six Lessons of Vivec, Fa-Nuit-Hen is said to have appeared to a Velothi tribeswoman, the wife of a Chimer netchiman, who had been impregnated with an egg by the dreugh before being brought to Azura's Coast by Sotha Sil. The egg contained the unborn Vivec, and seven Daedra known as the Barons of Move Like This appeared before the woman to teach the egg new swordsmanship motions. When Fa-Nuit-Hen appeared, he told the netchiman's wife to seek the Hortator in the land of Indoril before combining with the Barons to form a terrible pillar of fighting styles and teaching Vivec. Falx Carius, a Captain and later a General of the Imperial Legion, was an Imperial posted to Fort Frostmoth sometime before 3E 427 as a Knight Protector and Garrison Commander. He had numerous dealings with the Nerevarine during the latter's journeys on Solstheim. He died in 4E 5, but was raised from the dead later in the Fourth Era. A member of the mercantile Gardner dynasty who was proclaimed king when Wayrest first accepted ambassadors from the Camorian Empire, and was granted the right to call itself a kingdom in 1E 1100. A prominent Commodore of the Imperial Navy in the Third Era. He served in the war against the Camoran Usurper, and afterwards tracked down and destroyed the Red Sabre Pirates. He was the first Count of Anvil, and burned down the original ramshackle huts to build a new city in their place. Dunmeri patron saint of butchers and fishmongers. A fierce warrior, he slew many Nord invaders and drove them from Morrowind. He could neither read nor write, instead being blessed by receiving inspiration directly from the lips of Almsivi. The Cleaver of St. Felms is a holy relic greatly prized by the Tribunal Temple. When close to death, Sotha Sil placed Felms's soul into a modified black soul gem which was then brought to the Asylum Sanctorium and installed in a giant factotum body to make him immortal. Unfortunately, the process eventually drove him to madness, which manifested as agitation, a single-minded focus on fighting and conquests, and mood swings including outbursts of disdain, frustration, and anger. His relationship with the Marukhati Selective, a fanatical sect of the Alessian Order, and its goals is often contested by scholars. The ultimate goal of the Selective was to re-engineer the Aurbis in order to expunge the Aldmeri aspects from Akatosh. To achieve this, they required eight pieces of an artifact called the Staff of Towers. These segments had been deliberately separated and hidden in the early First Era due to the threat posed by the complete staff. Finoriell was a Bosmer woman who served as the Green Lady in the mid-Second Era. She was born in Deepwoods, a small village in the Malabal Tor region of Valenwood. Unlike previous Green Ladies, Finoriell was granted the position quite late in life, while she was living in Velyn Harbor. As the Green Lady, she became the embodiment of the physical side of the Bosmer, granting her supernatural fighting prowess and the "swiftness of the Green", the ability to cover vast distances in very little time. As is customary, she was married to the Silvenar, Edhelorn, at a handfasting ceremony in the city of Silvenar. Finoriell was known to love Edhelorn dearly. In 2E 582, the Bosmer entered into an alliance with the Khajiit and Altmer under Queen Ayrenn, forming the first Aldmeri Dominion. As representatives of the Bosmer people, the Silvenar and the Green Lady served as ambassadors. During a diplomatic visit to the small island of Khenarthi's Roost, the Maormer inhabitants attempted to prevent the island's Khajiit from joining the Dominion by assassinating Edhelorn with Daedric poison. With the death of her Silvenar, Finoriell was doomed to follow suit. She flew into a rage, tracking down Edhelorn's assassin and revealing the Maormer plot, which saved the city of Mistral from destruction and convinced the Khajiit of Khenarthi's Roost to join the Dominion. Unwilling to die without extracting vengeance upon her husband's killers, Finoriell swam the whole way to the southern continent of Pyandonea. She visited her wrath upon the Maormer, killing indiscriminately until she was spent. As she lay dying atop the highest sea-tower, the Sea Elves' greatest warrior came to claim her head as a trophy. Instead, she grabbed him and threw herself to the waves far below. Her niece Gwaering replaced her as the next Green Lady. In death, her soul journeyed back to Malabal Tor, to the sacred grove of Treehenge so that her soul could be "rooted". All incarnations of the Green Lady, known as "matrons" in death, root themselves at Treehenge to ensure the Green Lady's past memories are preserved. However, Finoriell's soul was unable to find its way to the grove due to the Worm Cult, who had invaded Treehenge to steal the rooted souls of past Green Ladies. Despite the help of the matrons and the guardian spriggans, Finoriell's soul was trapped and weakened by the Worm Cult, who attempted to corrupt her so that she would kill the Treehenge when rooted. Before she faded completely, Finoriell was rescued by the Soulless One and was able to root herself using the lifeforce of Hengekeeper Lara. She grew to become a sprout, and helped the other matrons drive out the Worm Cult before going to sleep. Fjori was a Nord huntress. When she was 29 years old, she fell in love with the warlord Holgeir on the field of battle, where they fought until her sword broke his axe and his shield dulled her blade. With Fjori and Holgeir united, there came a time of peace for the clans of the forest. When Holgeir was bitten by a poisonous snake, Fjori journeyed to obtain a cure from the Akavir which instantly cured him. However, then Fjori too was bitten by a snake, she died immediately due to exhaustion from her journey. Holgeir had a great tomb built, and after its completion, he took his own life, hoping to rejoin her in Sovngarde. Fortunata ap Dugal, also known as the Pirate Queen, was an Imperial pirate captain and leader of the Red Sails. Believed to have been born around the year 2E 542, Fortunata rose to become a powerful shipping magnate in the Gold Coast Trading Company during the Interregnum. She seized control of Anvil in 2E 577 and declared herself its Provincial Governor. She plotted to conquer the entire Gold Coast, but was assassinated by the Dark Brotherhood in 2E 583 at the behest of Count Carolus Aquilarios of Kvatch. Frandar do Hunding Hel Ansei No Shira, commonly known as Frandar Hunding, was a Yokudan warrior-prince and is considered to be the most accomplished Sword-singer and master Ansei in history. 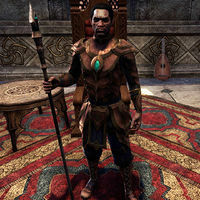 Born in 1E 720 [nb 1] in the province of High Desert in Yokuda, he is best remembered for being one of the first Yokudans to settle in Hammerfell, giving birth to the Redguard people in the centuries that followed. He is also revered for developing the "Way of the Sword", a martial philosophy on blade mastery. Frandar is the only "given" part of his name: "Hunding" is the name of the region of his birth; "No Shira" means person of noble birth and "Hel Ansei" is his title of Sword Sainthood in the language of Yokuda. Frathen Drothan was a rogue Telvanni Arch-Mage, and leader of the Drothmeri army. Although he received no support from the Great Houses of Morrowind, he assembled an army of mercenaries to topple Imperial rule. To do so he sought out Mehrunes' Razor, which was rumored to have been uncovered in the iron mines of Sundercliff Watch, an abandoned outpost in the Valus Mountains. In 3E 433 he set up base there and searched the ruins of Varsa Baalim, an Ayleidic city where the Nefarivigum was said to be. This was an evil construct of Mehrunes Dagon, created to test pilgrims seeking the Razor. Drothan decrypted the runes and was close to recovering the Razor, before the Champion of Cyrodiil defeated him and claimed the dagger. High Queen of Eastern Skyrim sometime during the Second Era, ruling from her seat in Windhelm. After King Logrolf's assassination in 2E 431, Jarl Svartr of Solitude claimed that Logrolf's daughter, Freydis, was illegitimate, and the Moot gathered to determine Logrolf's successor. Though Freydis was able to wear the Crown of Verity, a magical artifact created to test the worthiness of candidates to the throne, and thus named High Queen in Windhelm, a partial Moot in Solitude proclaimed Svartr as High King. Skyrim was thereafter split into the West Kingdom, ruled by Svartr and his successors, and the East Kingdom, ruled by Freydis and her successors, who renamed the Crown of Verity in her honor. In 4E 201 her legendary sword, fabled for its superior edge, was retrieved by the Last Dragonborn and presented to Jarl Ulfric Stormcloak as a gift. ^ a b Oengul War-Anvil's dialogue in Skyrim.